This is an extended discussion of the question that appeared in the Viewpoints department of the May/June 2013 issue of Dimensions magazine. 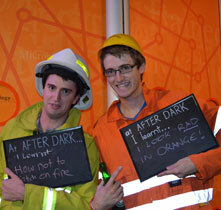 Scitech has been running adults-only nights twice a year since 2009, the year we turned 21. We started doing these evenings as we realized that there must be an increasing number of young people who had experienced Scitech as children, but most likely hadn’t returned as they were either not yet parents, or felt that the center was just for kids, and they wouldn’t feel comfortable visiting during normal opening hours where they would be bumping shoulders with 5- to 12-year-olds. These nights have been a marked success with an average of 800 people visiting during the Saturday night opening from 6 to 10 p.m., and with regular inquiries about the date of the next event. Even though families with young children will continue to be our primary target market, we believe it’s still valuable to engage young adults at our center, as it helps foster an increasing appreciation of the value and impact of science, technology, engineering, and math (STEM) in the Western Australian community, regardless of whether these young people work in a STEM field. There’s nothing wrong with science centers that focus on children—we need more children to feel competent and be interested in science. However, adults view science museums as reliable sources of science information, and it would be a shame to ignore the needs and interests of adults who, as citizens and voters, are asked to make decisions that increasingly involve complex science. Science centers that don’t focus exclusively on children should make an effort to provide science exhibits and programs relevant to adults who visit with or without children. Science centers suffer from a public perception problem; they are seen as “for” children, much more so than natural history museums. Perhaps a concerted, “industry-wide” effort on the part of science centers to prioritize, even temporarily, adult-oriented programming and exhibits could combat this perception and invite adults to view science centers as valuable community resources for lifelong science learning. How do we evaluate Return On Investment (ROI) for adult programs in science centers? Certainly not by numbers of participants or by revenue. So why struggle to develop new formats that do not appeal to our “core” visitors at a time of economic crisis? Is it the need to respond to changes in society? Is it to meet the challenge to be a major player in public discourse? Is it the opportunity to be more relevant in our community? When we talk about adult-oriented programs, we need to be more specific. Which public are we aiming for? Young adults? Mothers? People in mid-career? Retired people? All of the above? We believe these are still open questions and we are still in the development phase, an experimental arena for issues of science in society. The American Museum of Natural History (AMNH) has a long history of producing lectures, classes, and events marketed to adult audiences with great success, with a monthly series of Science Cafés being among the most recent popular additions. A recent survey of AMNH’s adult members and public program attendees found that demand for adult education opportunities is high, with the overwhelming majority of respondents indicating their interest in taking an adult learning class at AMNH and/or in becoming more scientifically literate. The challenge for this institution and perhaps for the field at this point is how to produce programming that is more intentional in learning goals for adults, tied to the critical issues of the day that impact our society and our world. To this end, AMNH is instituting adult learning classes in a series of scientific disciplines and across modes—on-site, online, one-day to multi-week. Some even have homework! I think that the dissemination mission of science museums can be especially effective when applied to one particular segment of the adult population: professional scientists. Nowadays, many scientists work daily on extremely specific scientific issues. There are many aspects of science that they do not know, and this situation may hinder them. Science museums can help them understand science as a broad and continuously growing discipline. Children’s exhibits within science centers have been addressing the challenge of effectively reaching their adult audiences for years. Many of us have seen a rise in visitation of families with young children who see museums as a great place for their kids to learn, but not necessarily as a learning opportunity for themselves. Many children’s exhibits have successfully engaged this “lost audience” in scientific thinking by integrating adult-centered programming, signage, and exhibits about the science of child development alongside exhibits for younger visitors. By using the science of how children learn as a vehicle to engage this captive adult audience in scientific inquiry, we meet our educational mission and impact the family members who will ultimately decide whether or not they will become repeat visitors. Prioritize? No. However, programming for adults should be a part of every science center’s public program schedule. Science centers exist to communicate science and technology to the population regardless of age, culture, or education. Having some form of programming for adults—be they just over 18, parents of school-age children, or grandparents—results in a community that is more aware of and more likely to discuss issues of science and technology. Our Science Time program for children ages 3 to 6 is designed just as much for the attending adults. It is all about influencing the influencers. The aim is to create a household comfortable with science where a child who talks about studying science in high school and university is encouraged and engaged rather than misunderstood and ignored. As cultural repositories of learning, it is not only the role of the science center, but also its moral obligation, to educate the adult public with science, for the lives of future generations depend on it. We are living in an era of seismic change—weather patterns are more erratic, the ice caps are melting, and biodiversity is dwindling. In a culture of limitless distractions, the real challenge is to capture the attention of adults. Adults model behavior for their children and ultimately create future science center visitors, so it is their patronage that is essential. Science centers need to incorporate programs of interest to adults like digital media labs, cultural mash-ups, young entrepreneur centers, games for social change, and legible cities projects. The challenge for science centers will be to develop these new models without losing their existing audience and while leveraging their current assets. The Koshland Science Museum’s mission is to help teens and adults use science to solve problems. Our exhibits and programs are based on the work of the (U.S.) National Academy of Sciences and National Research Council. We were intentional about selecting our audience and felt that we could help fulfill an unmet need. Over time, our core audience of educated adults between the ages of 20 and 30 has increased, with many repeat visitors to programs and events. Benefits of this approach include the length of engagement and the quality of conversation. Our audience often spends a few hours or more participating in substantive discussions and in-depth workshops. Challenges include facilitating discussions about complex issues, such as climate change, to foster critical thinking and decision making. Marian Koshland Science Museum of the National Academy of Sciences, Washington, D.C.
Science centers should absolutely prioritize adult-oriented programming. The evidence lies in changing visitor demographics! This is an opportunity to cultivate interest and relationships with new audiences. Adult programs can generate significant revenue efficiently, in a three-hour block in the evening, for example. Having local businesses as guest experts and experience providers furthers relationships with community partners. It can be challenging, particularly in a smaller community, to predict audience participation. We’ve enjoyed success by ensuring visitor “buy-in” with popular topics, and by getting to the root of what people want from their experience. Sustaining that interest is also key to successful adult programming. Our recent findings show that adults of all ages want more opportunities to enjoy an intellectual evening out with friends embedded within a social environment. An adult evening at a science center provides a dynamic and new dimension to visitor experiences. Many adults feel that science centers are just for children. When we hold cool events for adults, where kids aren’t allowed, we send a strong message that says we want grown-ups to feel welcome too. In today’s world, adults need to nurture their own curiosity, creativity, and critical thinking skills as much as kids do. Adult programming, designed just for them, keeps them actively engaged in figuring out how they like playing with science, developing a passion for it, and discovering science’s purpose in their lives—with the option to have a beer while they do! At the Museum of Life and Science, we love these programs because we’ve discovered an entirely new audience of people who are hungry to reconnect with us after forming fond memories of museum experiences as children. We’ve also discovered a new source of revenue. In our most recent adult-oriented program, Museum After Hours: The Science of Eats, we sold over 700 tickets and grossed over $10,000. Everybody wins! The above statements represent the opinions of the individual contributors and not necessarily the views of their institutions or of ASTC.